A true triple threat performer with nearly 30 years of professional experience. 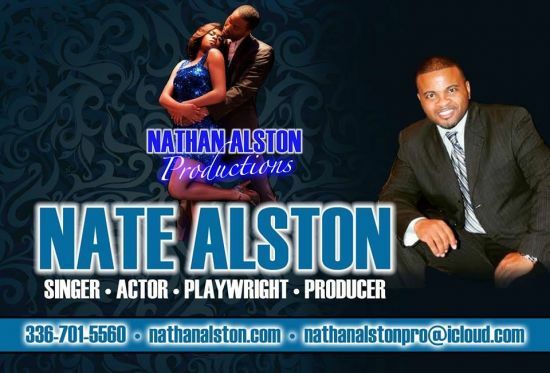 Nathan "Nate" Alston has toured all over the world sharing stages with divas such as: Patti LaBelle, Gregory Hines, Lou Rawls, Broadway's Rhetta Hughes & Valisia LaKae, Amsterdam's Michelle David, and many others. From 1997 to 2000, Nate lived in Amsterdam, Holland and performed with Stardust Theatre, a Dutch touring theatre company. He starred in 3 European tours: THE GLORY OF GOSPEL; MAHALIA SING SISTER SING; & THE YOUNG MESSIAH - A BLACK CELEBRATION. All 3 tours were written, directed and choreographed by Tony Award Nominee, Mabel Robinson. Nate wanted to try his hand at writing & producing, so in 2006, he teamed up with the Barn Dinner Theatre in Greensboro, NC. He penned his first production, LOVE MACHINE THE MUSICAL a classic Motown & Soul revue. The show was a huge success! It ran for 6 weeks to continuous sold out houses. 6 more weeks were added on and sold out within days. LOVE MACHINE THE MUSICAL returned 3 more times over the next 12 years making it the most requested, highest presold, most profiting show in the 50 year history of the theatre. Over 100,000 fans have seen LOVE MACHINE THE MUSICAL. His other writing and producing credits include: DREAMS OF A KING: THE LEGACY OF MARTIN LUTHER KING, JR.; SHOWTIME IN HARLEM; SOUL SISTAS THE MUSICAL; CHRISTMAS IS; THE JOE'S GREAT ADVENTURE; GRITS & GRAVY: A SOUTHERN DECLARATION, SOUL SISTAS OF GOSPEL (2018) & SOUL KINGS (2019).